The transmission of Buddhism from India to China paralleled an active trade between the two cultures. Most overland trade moved along a skein of routes that ran from, depending on the period, either Xi'an or Luoyang in central China, then along either the northern or southern route around the infamous Taklamakan desert, to routes that headed south from Kashgar and some of the central Asian oasis cities to India via Pakistan, Kashmir, and Nepal. Although there is more literary evidence describing passage along the overland routes than the maritime ones, Chinese archeologists have discovered in Guangzhou (Canton) the site of a boatyard that was in operation during the Qin and Han dynasties (3rd – 1st century B.C.E.) where seagoing vessels were built. Buddhism reached China by the first century C.E., and afterward a constant influx of Buddhist missionaries, manuscripts, and images traveled from India to China via the overland and maritime trade routes. The religion was often initially absorbed into existing religious practices before believers became converted to its new moral code, but it was eventually adopted in all levels of Chinese society. A pair of seated bodhisattvas in what is often called a "pensive pose" (Fig. 1) has an iconographical prototype in earlier sculptures from the Indian regions of Gandhara and Mathura. Many examples of steles with this subject were produced in China during the mid-sixth century. Although it is thought that the bodhisattvas sit in a paradise, the exact meaning of the image is not fully understood by scholars. 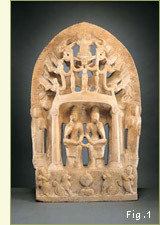 Another Chinese object from the late sixth century in the Asia Society's collection (Fig. 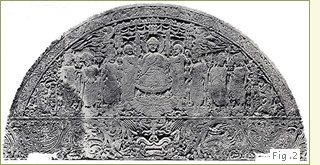 2) is a carved limestone tympanum almost six feet in width, which most likely came from a pagoda doorway. It also depicts a paradise scene, a theme that was popular during the sixth century, when China was politically and economically unstable. Paradises, known as Pure Lands, were rest stops on the long road to enlightenment. They offered a salvationist release from the chaos of life. Pure Lands were heavenly worlds where the worshiper could practice Buddhism for enough lifetimes to gain sufficient merit to reach enlightenment in some later earthly incarnation. The Tang dynasty (618 – 906 C.E.) ruled an extensive empire that stretched from the Pacific Ocean to the Caspian Sea. Trade was protected and increased enormously, and as a result, the Chinese capital of Xi'an, at the eastern end of the Silk Road, fostered a wealthy, cosmopolitan population and became a center for literature, music, and the visual arts. Buddhist art produced during the Tang dynasty is often referred to as an international style because of its amalgamation of Chinese, central Asian, and Indian prototypes and the transference of this style to Korea and Japan. 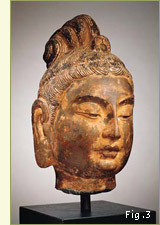 The Tang head of a bodhisattva (Fig. 3) radiates a serene quality, due to its downcast eyes, meditative expression, as well as a sophisticated demeanor that characterizes the international flavor of the Tang dynasty. The elaborate coiffure and the plaque in front of it establishes this elegantly carved head as a bodhisattva's, but its exact identification cannot be deciphered from the symbol painted on the plaque. Buddhism was first adopted in Mongolia in the mid-thirteenth century by Khubilai Khan, the grandson of Genghis Khan, and by other elites. Khubilai, who was the first emperor of the short-lived Yuan dynasty in China (1279 – 1368), patronized and supported the chief figure of the Sakya sect of Tibetan Buddhism, Phagspa (1235 – 1280). However, it wasn't until the religion went through a revival from the sixteenth to the eighteenth century that most of the Mongol population converted to Tibetan Buddhism. This renaissance was begun by Altan Khan, who invited the noted teacher of the Geluk sect of Tibetan Buddhism, Sonam Gyatso (1543 – 1588), to Mongolia. Sonam Gyatso taught and converted Altan Khan to this school of Tibet's Vajrayana Buddhism. In thanks, the Khan bestowed upon his Tibetan teacher the title of Dalai ("Ocean") Lama. A White Tara (Fig. 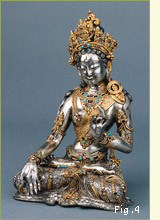 4) is a fine example of Mongolian metalwork from this latter phase of Mongolian Buddhism. This sculpture was, like most of Buddhist art produced in Mongolia during the sixteenth to eighteenth century, strongly influenced by Tibetan art of the same period.